Prosper is a small town located on the western edge of central Collin County. Conveniently situated directly off of Highway 380, which is intersected by Loop 288, Dallas North Tollway, and Highway 75, Prosper residents have quick and easy access to both Denton and Dallas. The city enjoys enough distance between itself and Dallas to be able to offer its residents something the bigger cities cannot so easily do: space. Living in Prosper gives citizens the freedom to spread out, but still be a part of a cohesive community. The residents of Prosper really come together over the schools. Prosper operates its own school district, Prosper ISD, and takes extreme pride and care in the education of their children. All Prosper elementary schools received an “Exemplary” rating for 2010. The school board has also recognized the importance and many benefits of early, second-language acquisition; a Dual Language program has been incorporated into the elementary level (Pre-K – 5th). 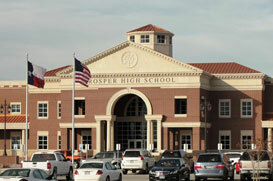 Prosper High School opened in August of 2009 and is truly state of the art, providing wireless access throughout the campus. The district realizes the growing importance of technology and ensures their teachers are current in new technologies by including technological support within the staff. Prosper has not only proved itself in the classroom, but on the field as well. In 2008, they were the football 3A State Champions. These are just a few of the benefits residents enjoy that contributed to D Magazine’s ranking of Prosper as #5 in “The 10 Best Dallas Suburbs” list. Located just north of Prosper on Highway 289, Celina even further separates itself from the hustle and bustle of the Metroplex. Celina residents enjoy a simpler lifestyle while still being able to commute or take a fun, day trip to Dallas. With the exception of two gas stations and a small car dealership, Celina did not have any chain businesses until 2003 with the arrival of a Sonic. As Celina is experiencing growth, the city has quickly adjusted to the financial aspect brought with more businesses and residents. Standard & Poor’s, a financial analysis company, recently raised the city’s underlying credit rating to “A, with stable outlook.” Another mark the city received was for the work of the police department. The National Association of Town Watch awarded Celina as #1 in Texas for “Organization and Involvement in a Community for Towns under Population 15,000.” Celina is still probably best known though for their Bobcats. The high-school football team holds a UIL record of eight state titles. This is not only a source of enjoyment for the residents of Celina, but pride as well. The district though, is careful to not allow sports to outshine academics; the Celina ISD was rated as “Exemplary” in 2010 by the Texas Education Agency. Celina has proved itself as a well-rounded community that honors small-town values.